Here is a round-up of what I’m crushing on right now! My favorite health and style interests for early autumn along with a life-changing recent read. 1) H&M pants – I recently purchased both pairs pictured and I’m smitten. I’m loving the lean, cropped trend. Get the granny chic pair here and the black pair here. Oh and H&M’s Studio collection launched last week and I want to wear it all. 2). Molly Packs – These bags are such high quality leather (I own one in black) and they can be worn around your waist as a fanny pack, cross body, over the shoulder, or you can remove the strap to wear as a clutch. I love the fall pop of orange on the Scaled Stone Fringed Circle pack. 3). 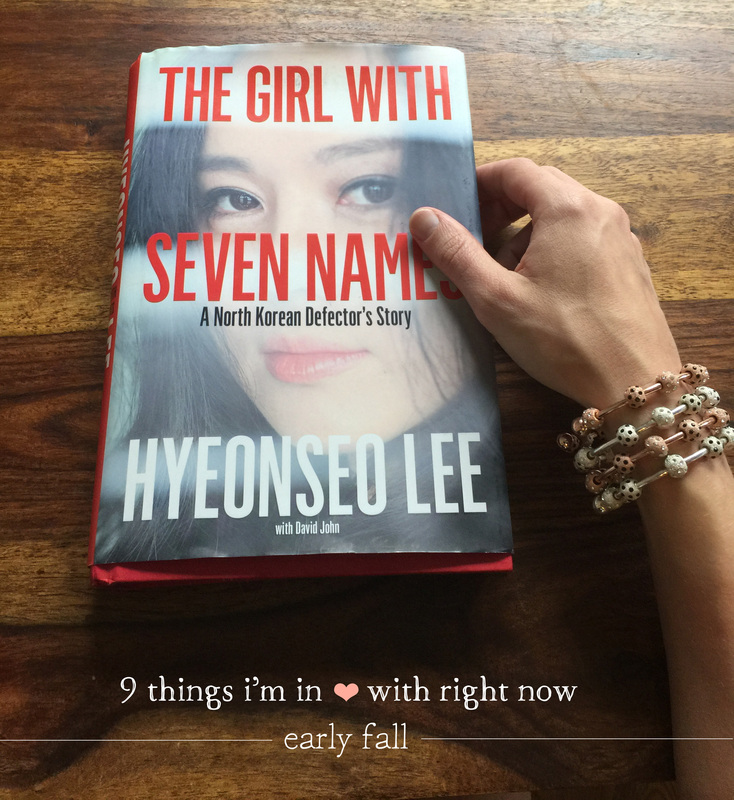 The Girl With Seven Names by Hyeonseo Lee: You will not want to put this book down! It’s the first credible account of ordinary life in North Korea. One of the most inspirational stories I’ve ever read. Hyeonseo’s spirit will make you rethink human limitations and what is important in life. 4) Vega flush mount lamp – I’m obsessed with lighting, particularly round lighting. We need a new flush mount in our butler’s pantry area and I have my eye on this. I like the art deco feel. 5) Nunzio Saviano Anti-frizz sheets – So my hair is one big frizz bomb. These sheets help to tame my mane using non-sticky polymers to provide a touch of hold plus a bit of coconut oil for healthy shine. 6) Lola Donoghue Paintings – Her abstracts are lovely and I like that they aren’t too saturated while also being bright and interesting. 7) Dayna side chairs – I think these Chippendale chairs in warm gray are fantastic and would fit in a traditional, transitional and even a modern space. 8) Count Me Healthy Ladybug Crystal Bracelets – I’m so proud of this new little collection because the onyx crystals go so well with gold, rose gold and silver. A beautiful way to track three get fit for fall goals at once. 9) Trader Joe’s Maple Water – This water has half the calories and sugar of coconut water (yay!) and has a hint of mapley sweetness. I’m a fan.